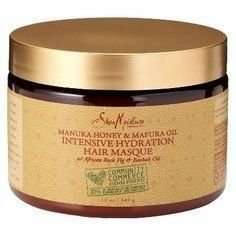 There are many deep conditioners with some new miracle oil on the market touted as the next best thing. As a recovering PJ (Product junkie), it’s disappointing to jump on the bandwagon and discover the product doesn’t even kind of live up to the hype. After some testing and research, I have settled on these products but before we delve into that, let’s discuss what makes a deep conditioner with oil relevant to your regimen. The oil has to be high up on the ingredient list or the main component of the product. If the oil is listed too far down the list, enough of it isn’t featured in the product to make a significant difference to your hair. I haven’t tried every product in the Shea Moisture line. You have to be a seriously dedicated PJ to get through their entire product line. However, there are a few that fall into the category of this article that are excellent. The most popular collection is the Jamaican Black Castor Oil collection. However, my favorite deep conditioners with natural oils include – Mongongo & Hemp Seed Oils High Porosity Moisture Seal Masque, Manuka Honey & Mafura Oil Intensive Hydration Masque & Tahitian Noni & Monoi Smooth & Repair Nourishing Hair Masque. 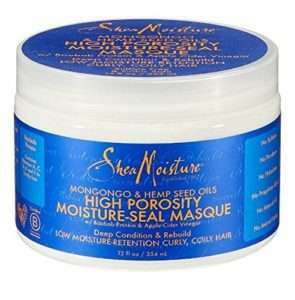 Mongongo & Hemp Seed Oils High Porosity Moisture Seal Masque contains some of the best moisturizing oils for dry hair – mongongo oil and hemp seed oil. Additionally, it contains argan oil and castor oil. The Manuka Honey & Mafura Oil Intensive Hydration Masque contains shea butter, mafura oil, baobab oil, avocado oil and coconut oil. These are all excellent moisturisation ingredients. Tahitian Noni & Monoi Smooth & Repair Nourishing Hair Masque contains monoi oil, a great hair and skin softener derived by infusing the tiare flower in coconut oil. It also contains argan oil and coconut oil. 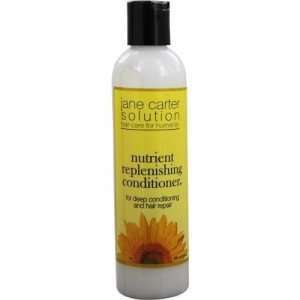 This conditioner contains jojoba oil, an excellent treatment for a dry scalp. 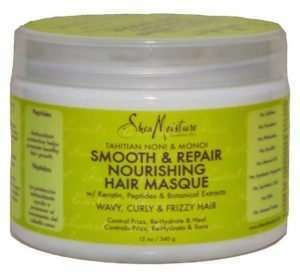 It also contains soybean oil as well as some great herbs for hair – nettle, sage & henna. I’m late to the train for Mille Organics products. I only stumbled on it via Instagram a few months ago. I love the packaging as well as the product line. 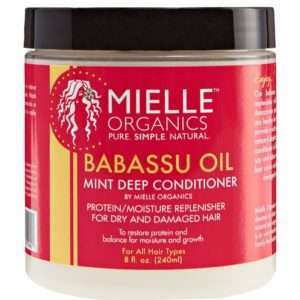 I settled my sights on this deep conditioner because I love babassu oil. Babassu oil is a cousin to coconut oil. It penetrates the hair shaft quickly and has a tendency to form a protective coating over dry strands. The mint in the conditioner also soothes the scalp. You can read an in-depth article about babassu oil at Achieve Moisturised Hair with Babassu Oil. I’m a big fan of the argan oil from this line. They also produce some excellent essential oils. 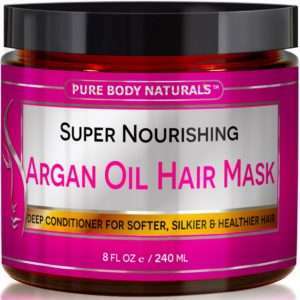 Argan oil is a very powerful oil for treating damaged and over-processed hair. Pure Body Naturals has quite a few products in their line but two particularly stand out when it comes to deep conditioners. The Argan Oil Hair Mask & Coconut Oil Hair Mask. 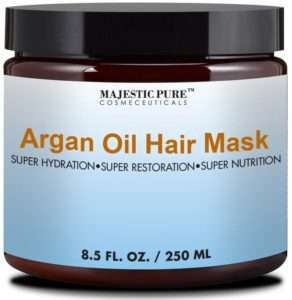 The argan oil mask contains shea butter, coconut oil, argan oil, rosehip seed oil and vitamin E oil while the coconut oil hair mask contains coconut oil, rosehip seed oil, vitamin E oil and argan oil. 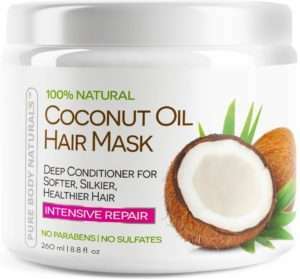 When it comes to fighting dry and dull hair, these are the types of masks you want to include in your stash. Keep in mind that you can also use the oils individually or add them to your favorite conditioner. It’s all down to personal preference. 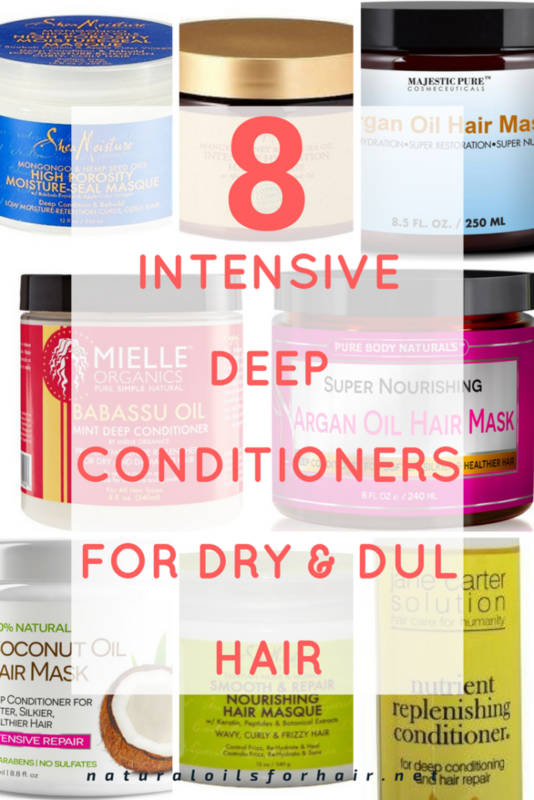 There are several other popular deep conditioners on the market but I’ve recommended the ones that are as close to natural and organic as possible. They mostly don’t contain additives like lanolin and liquid paraffin. They are also paraben and sulfate free. This doesn’t mean deep conditioners that contain these products won’t work on your hair. Everybody’s hair is different and reacts differently to products.